There were 728 press releases posted in the last 24 hours and 153,572 in the last 365 days. Exhibit runs from March 3 – September 1, 2019, with media preview on Thursday, February 28, 2019. – Curated by Gabriela Martinez, MOLAA Curator of Education, with Rogelio Gutierrez, Associate Professor of Art at Arizona State University, Gráfica América celebrates the collaborative spirit of printmaking through historical prints and publications as well as contemporary and experimental works made by Latin American and Latinx printmakers in print shops, publishing house and artist collective studios. 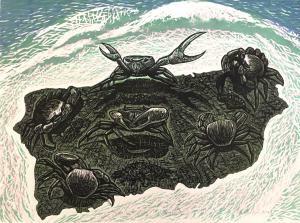 The exhibition features works by approximately 100 artists and master printers from across the United States, Mexico, Central America, South America and the Caribbean including Pepe Coronado, Sandra C. Fernández, Fernando De León, Miguel Ledezma, Poli Marichal, Lorena Padral, Coral Revueltas Valle and Humberto Saenz. Also represented are collective workshops including Taller de Gráfica Experimental which was established in Havana, Cuba in 1962 by Cuban artist Orlando Suárez and Chilean painter José Venturelli and Estampa Feminista from Buenos Aires, Argentina, Taller de Gráfica Popular, Mixografia, Centro de Arte de Puerto Rico, Self-Help Graphics and Art, Dignidad Rebelde and INKspira among many others. These artists’ prints are rooted in the philosophy of communal and collaborative working. They practice in workshops and educational institutions where artists hone their visual voices, activists and communities come together to negotiate cultural expressions, and individuals of diverse backgrounds are given a platform through which to tell their stories. This exhibition accentuates the radical political role of printmaking in Latin America’s history and creates an environment through exhibition and workshops in which those ideas and skills can be shared with a new generation of artists and community organizers in Southern California. The Museum of Latin American Art (MOLAA) was founded in 1996 in Long Beach, California and serves the greater Los Angeles area. MOLAA is the only museum in the United States dedicated to modern and contemporary Latin American and Latino art. In 2007, MOLAA unveiled its newly renovated and expanded campus designed by prominent Mexican architect, Manuel Rosen. The expansion more than doubled the Museum's size, adding a 15,000-square foot sculpture garden. With its physical expansion complete, MOLAA’s focus is on strengthening its collection, which now includes over 1,600 works of art and maintaining its position as a multidisciplinary institution providing cross-cultural dialogue. For More Information: mike@ileanainternational.com or 310-913-0625.